The 6th grade English department is going to begin utilizing a single Google Doc housing all student work over the course of the school year. This document will contain multiple student entries including first drafts, second drafts, and final copies of their written work. Having all of this information housed in a single Google Doc sounds as if it may be a messy ordeal. 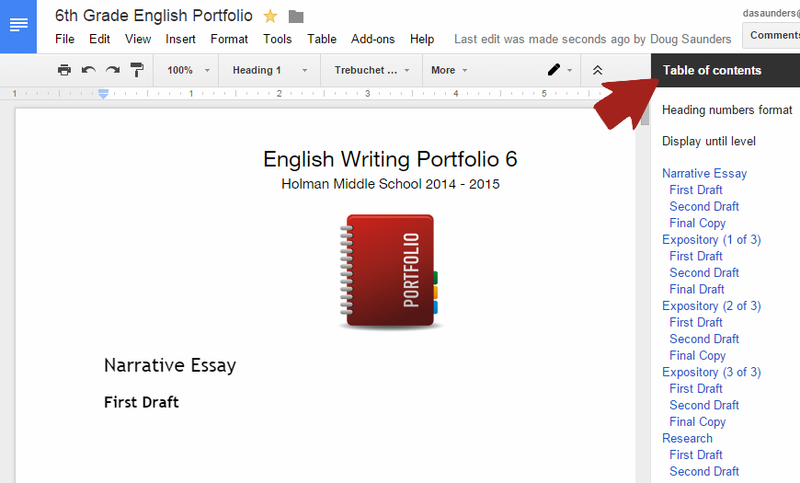 However, with the addition of the Table of Contents Add-On for Google Docs, the students will be able to easily navigate to any page of the document. The Table of Contents Add-On places a nifty little table of contents column on the right side of the document. This navigation window stays open the entire time and allows for easy access to any page within the document. Adding sections to the table of contents requires the teacher and/or students to create a heading within the document. Format --> Paragraph Styles --> Insert Heading. Whenever a heading is added, a new section appears in the table of contents panel. You can view the 6th Grade Writing Portfolio by clicking here.